Amazon Vs Flipkart: Who's Winning The Battle? That is as close as it gets! They may even flip-flop daily. In February, Flipkart became the 1st app in India to cross the 50 million install mark. This number is much larger than Amazon as Flipkart has been around longer. Flipkart seems more focused on app usage. Whereas Amazon now gets more monthly website visitors from search. For now, Flipkart has a much bigger base, but Amazon looks to be coming on strong. As you can see Flipkart sees a decrease as Amazon is seeing a surge. It looks as if Amazon is on the brink of taking the search traffic crown. There may be a new leader here in the next couple of months. Looking at e-commerce special offers is often a good indicator of their marketing efforts. Both Amazon and Flipkart offer good sales and discounted items all the time. However, Amazon does have the edge in that they have offered promo codes in the past that have big discounts sitewide. Flipkart makes sale on items and categories.When you see offers for loyal customers, it is a good indicator they are trying to do a sales push and move inventory. This part of the battle is a tie. Depending on the time of month you will find good deals from both companies. What's the verdict between Amazon vs Flipkart? As you can see body blows are happening between these two giants. It might be a couple of years before we see a clear winner. For now, you will just have to check each one and compare. 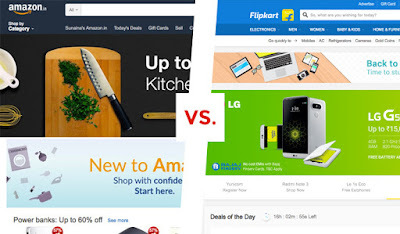 Who's your favorite: Flipkart or Amazon? Leave your choice in the comments below.